RIBA International Prize: a vertical, concrete university campus in Peru by Grafton Architects has been named world's best new building by the Royal Institute of British Architects. Dezeen is media partner for the RIBA International Prize, which aims to celebrate new public buildings that have made a difference to the people that use them, as well as surrounding communities. Described by judges as an exceptional example of civil architecture, the Universidad de Ingeniería y Tecnología (UTEC) is the first ever winner of the prize. Grafton Architects collaborated with locally based Shell Arquitectos on the project. It comprises a campus for a specialist engineering university in Lima, located at the edge of a deep gorge in the city's Barranco district. A series of landscaped terraces with clefts, overhangs and grottos make up the vertical campus building, and also provide shade. Inside, a succession of platforms create open circulation and meeting spaces. Teaching rooms, laboratories and offices are enclosed, inserted into and suspended from the exposed concrete structure. "We found that the educational aspirations of the client together with the unique climatic conditions of Lima gave us the opportunity to 'invent' a new vertical campus for their new University of Engineering," explained Grafton Architects directors Yvonne Farrell and Shelley McNamara. The prize was open to buildings of all type, size and budget, completed by a qualified architect in any country in the past three years. UTEC was selected ahead of five other shortlisted projects: Arquipelago Contemporary Arts Centre by Menos é Mais Arquitectos and João Mendes Ribeiro; Heydar Aliyev Center by Zaha Hadid Architects; Museo Jumex by David Chipperfield Architects; Stormen Concert Hall and Library by DRDH and The Ring of Remembrance memorial by Agence d'architecture Philippe Prost. Headed up by architect Richard Rogers, the jury also included American architect Billie Tsien, NLÉ founder Kunlé Adeyemi, British architect Philip Gumuchdjian and Marilyn Jordan Taylor, dean of the University of Pennsylvania School of Design. 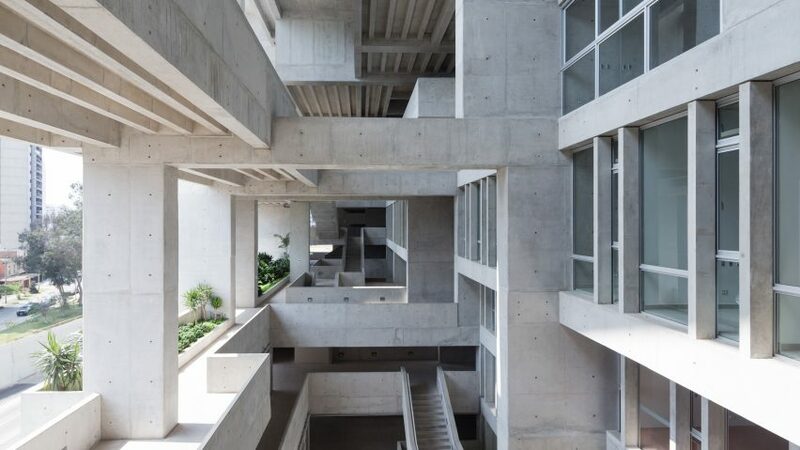 "Grafton Architects have created a new way to think about a university campus, with a distinctive vertical campus structure responding to the temperate climatic conditions and referencing Peru's terrain and heritage, " the jury commented. "UTEC is an exceptional addition to the city of Lima, and a project that will inspire other architects and universities all over the world," added RIBA president Jane Duncan. "Grafton Architects have created an innovative new model for a university campus that is highly responsive to its local environment and community," she continued. "The concept of a vertical campus defies convention, as does the mix of open and enclosed spaces, but both are key to the success of this building visually and spatially. Grafton Architects is based in Dublin. Earlier this year, the firm was selected to design a new faculty building for the London School of Economics, while its medical school and student housing complex in Limerick was shortlisted for Stirling Prize in 2003. The RIBA International Prize replaces the Lubetkin Prize, which was awarded annually to an RIBA member architect for a building outside of the European Union. It runs alongside the Stirling Prize, the most prestigious UK architecture award. The move is part of a wider revamp of the RIBA's annual awards programme, which last year saw the former Manser Medal award for one-off house rebranded as House of the Year, with the shortlist and winner broadcast in a TV series.